DAHAB - SINAI, OCTOBER 2004 - We were staying for 5 days in Dahab in Sinai, on the Red Sea coast. 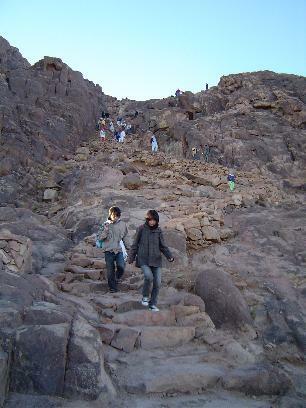 From Dahab I made a trip to Sinai mountain, which is an hour or so away, and climbed this holy mountain... at night ! The reason many people climb this mountain at night is obviously to see the sunrise at the top, which is, I must admit, absolutely stunning. 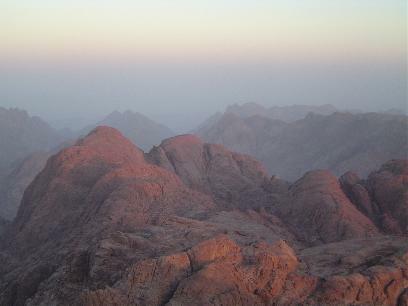 Some people tend to forget that it gets cold at night in the desert of Egypt, especially on top of a mountain. The wait till sunset was still a couple of hours, but the spectacle during the last half hour when the sun slowly came from behind the mountains was spectacular. After the last stars were gone, the mountain silhouets were becoming visible, but only faintly - it took still quite some time till the sun was appearing, first as a tiny dot , then in all its grandeur and brightness. The mountains were coloured in red all over now and only at this moment one could see how fantastic this point was we were standing... Most people hurried down immediately, I stayed a while to enjoy the feeling, and to go to the worst bathroom of my life on top of Mt. 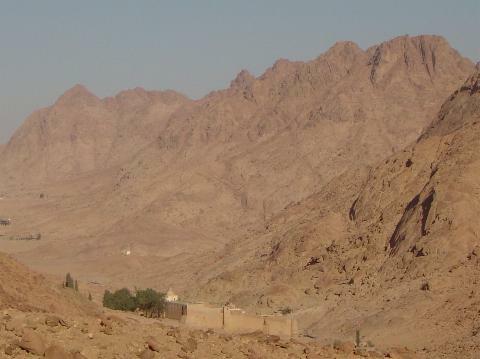 Sinai (highly not recommended). The road down was easy and no problem at all for me with the hiking boots, the 'hikers with the slippers' had more problems. And it is getting hot very soon ! When we arrived at the parking lot again, we waited to be allowed inside the Saint-Catherine monastery, which is an orthodox monastery and has a nice collection of old icons - too bad the monks don't allow you to look carefully and the lighting is really bad inside. Also inside is the burning bushes that Mozes encountered. A great way to end the climb of a holy mountain. By the way, after you have visited the monastery, there are some cafés around, so relax, have a drink and wait till your bus arrives. Another refreshing experience.